The concentric tubular electrode (CTE) is a design innovation that has significantly improved the Sodium Hypochlorite generation process. In this design, there are two tubes placed one inside the other, and the seawater flows between thetwo tubes.Theouterand the inner tubes act as Anode and Cathode alternately. This design of electrochlorinator has eliminated the problems faced by the otherwise popularParallel Plate design. The seawater flows through the annular space between the outer and inner tubes. The flow is horizontal and at a higher velocity. The sea water that flows inside the tubes does not encounter any sharp corners or gaps or areas of low flow, which would otherwise induce deposition of calcium or magnesium salts resulting in the formation of scales. Sodium Hypochlorite is a strong disinfectant that kills all the pathogens which lead to water borne diseases like cholera, typhoid, paratyphoid etc. Our system also leaves some residual Sodium Hypochlorite in water to prevent bacteria from getting picked up during storage or redistribution. 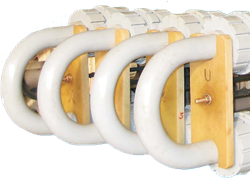 We offer capacities ranging from 0.5 kg/hr to 100 kgs/hr in modular design. Larger capacities can be designed as per customer specifications. We, at Pristine Water along with our associate company Ti Anode also undertake the refurbishment of old Electrolyzers.